I’m either a collector or an accumulator, depending on your point of view. Either way, I keep little bits and bobs on surfaces around my house, and I always have. These are things that I like being able to see or touch. Some of them are things I just need to know are there. 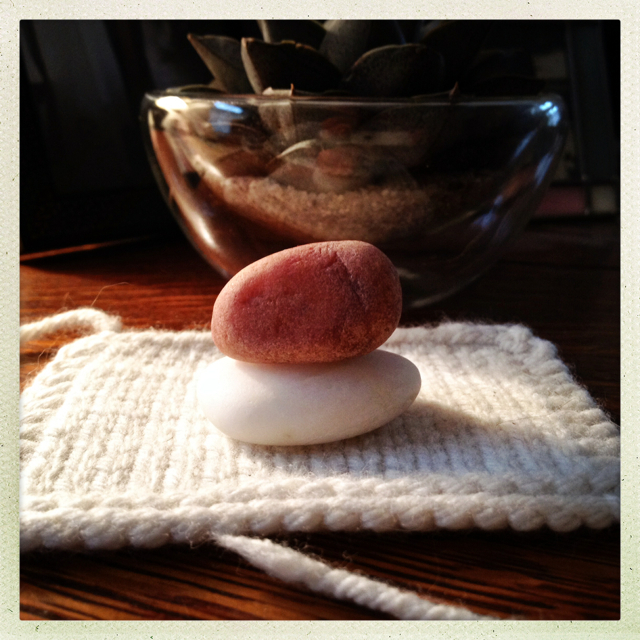 These stones from my beach fit perfectly in my palm, and this swatch is a bit of yarn given to us at the Knitter’s Review Retreat. Rosemary likes to take the pink stone and shove it to the floor, just because she can. Then, as all cats do, she loses interest. I’m beginning to gather myself up and move forward. There’s so much to do, and most of it is more important than this household overhaul, but I have to say that all the sorting and assessing is good for me. I feel able and centered and open in a way I haven’t in a long time. The project isn’t going at full tilt any more (without Niece Becca it’s just not the same) but that’s fine. I look at the bits of my life as they emerge from boxes and drawers, and I’m glad to know they’re there. P. S. I’m playing with the blog. Indulge me. Hello Jane, you remind me of what my house is like. I, of course, have lots of stones around, in dishes etc from my mother’s stuff and from little shops here and there. It’s a gentle way to live, frankly. My home is much the same–my husband calls it Flat Surface Syndrome. But those bits and bobs, as you call them, keep people and memories current in my mind, enriching my days with the fullness of things otherwise forgotten. Modern, sterile spaces make me uneasy. When my life is in a transition phase, I always find peace and solace in organizing myself. External sorting . . . helps me sort out the inside, too.